If you were looking for a classic cottage garden plant, then Hollyhocks (Alcea rosea) would be one near the top of the list. Tall growing, large open flowers, and a magnet for bees and butterflies, they are also easy to grow. You can grow them from seedlings, or directly from seeds purchased online. A biennial or perennial, depending on variety Hollyhocks will self seed and come up every year in good conditions. Grown for the towering flower spikes that can reach well over 2 metres (6ft) in height. These are plants that add height to the garden border, and they are very popular in cottage gardens. Available in a range of flowers colours, and also both double and single flowering types, these old fashioned plants are well worth seeking out. The botanical name of the most common form is Alcea rosea however over 50 species are available with many hybrids. 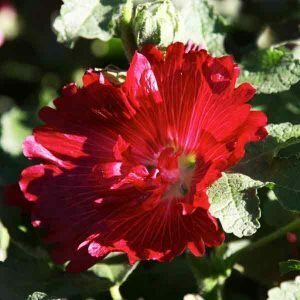 You will now find dwarf Hollyhock varieties for sale in many of the better nurseries. How to grow Hollyhocks from seed. The best time to plant Hollyhock seeds is when the weather warms up a little. As a rule, early spring, or after the last frost is the best time. Hollyhock seeds need moisture to grow. 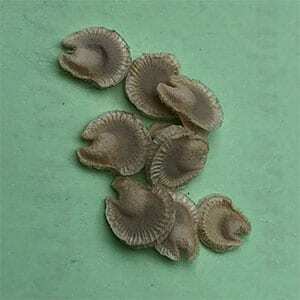 You can plant them in seedling trays, or directly into the garden. Prepare some humus rich well dug growing medium for trays. Similar conditions in the ground. The seeds need warmth and moisture to germinate. After around 4 weeks they are ready to either plant out from seedling trays. Or to thin out in the garden. The seedings should be 30 – 60 cm apart. Generally Hollyhocks will not flower until their second year. Best grown in full sun, although they will flower in part shade in warmer climates. If you have reasonable soil, with good drainage you will have few problems. Seeds are best sown directly as soon as the danger of frosts has past. Dig the soil over well adding some compost and well rotted cow manure. Plant the seeds just below the surface. Keep the seedlings moist until they are well established. You can much around the plants to maintain a little moisture. Water during long dry spells until flowering in completed. Watering will extend the flowering period. When planting Hollyhocks remember they prefer full sun and a humus rich well drained soil. Hollyhocks will self seed. Any plants that send up a flower in the first year should have that removed, it will only produce a weak flowering spike. Use Hollyhocks in the garden border to add height. Plant them at the back of the border, or be brave and plant them near the front where the towering spikes can be fully appreciated. Hollyhock seed specialists of perennial and annual varieties.